Hello and happy Friday! I am sad to say that today is our last challenge!! I have enjoyed my time so much on the Challenge design team and will miss it very much as well as my fellow Inspiration teamies. A big thanks to Michele and Alanna for having faith in me when I was a newbie to blogging. You haven't seen the end of me yet though!! Stay tuned! Anyway on to our final challenge which is Dry Embossing. Since CAS-ual Fridays don't have any embossing folders, I pulled out my Stars Fri-dies and ran them through the big shot with an embossing mat. I must say I have never used my dies for embossing and I think I will be doing it more often. The possibilities are endless! I heat embossed the sentiment from the Merry stamp set with silver embossing powder and die cut some of the stars from silver glitter paper. If you would like the chance to win a US$25 gift voucher from the CAS-ual Fridays shop, all you have to do is make a card using dry embossing and link it up over HERE. If you use CAS-ual Fridays products as the main focus of your card, Michele will double the prize to US$50. We would love you to join us for our last challenge! Hello and happy Saturday! 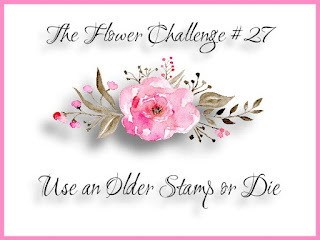 My card today is for the latest challenge over at The Flower Challenge where this month it is "use an older stamp or die". I have used the Demure stamp set from Penny Black. I have had this stamp for a few years and only used it a couple of times! I stamped it with CP Midnight ink and coloured it in with a Crimson Kaszazz Alcohol marker. I used Prisma coloured pencils for the shading. The sentiment is from Label Love from Altenew and I adhered it onto my card panel with foam tape. I think I will use this stamp set more often as it came together very quickly! I am also entering this card into the Muse challenge where they have a "free for all" challenge. Anita is the Muse with a beautiful feminine card so I thought my floral card fitted in! Hello and happy Friday! This week at CAS-ual Fridays challenge blog we have an inspiration photo for you. I took inspiration from the Christmas ornament and pulled out my Ornament Tag Fri-Die and the Mistletoe & Holly stamp set. I stamped the mistletoe and gold heat embossed it. I coloured it in with Altenew Artist markers, ran a glue pen around the edge of the die cut and sprinkled it with gold glitter. Click HERE to take you over to the challenge blog and see how the other DT members were inspired. If you would like the chance to win a US$25 certificate to spend in the CAS-ual Fridays shop, all you have to do is make a card using the photo as inspiration and link it up to the challenge here. You don't have to use CAS-ual Fridays stamps but if you do use them as your main focus, Michele will double the prize to US$50. Hello and happy Sunday! 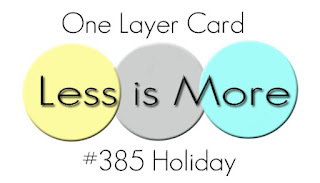 My card today is for the latest challenge over at Less is More where the theme is OLC Holiday. I actually love a one layer card but I have to be careful not to make any mistakes because you cant cover them up with an embellishment! I've used two very old stamp sets for my card today. I stamped the tree with Kaleidacolor Caribbean Sea ink and added some diamond glitter to it using a quickie glue pen. I also added some glitter along the bottom of the trees. The sentiment is an old wooden stamp from Stampin Up Teeny Tiny Sentiments and I stamped that in CP Midnight ink along the side of the tree. This card came together very quickly, I think I will make a few more in different colour combinations. A pink one would look good!! Click HERE to take you over to the Less is More Challenge. Hello and happy Sunday! I made this cute reindeer card for a crafty friend and thought I would enter it into some challenges. I found two "new to me" challenges that this card fits! The first one is the Alphabet Challenge Blog where this weeks challenge is R for Reindeer. Perfect! The next one is 2 Crafty Critter Crazies. I have used a digi stamp from Bugaboo Stamps. I used a mixture of Copics, Altenew Artist markers and Kaszazz alcohol markers to colour the image in and added some glitter around the panel. Thanks for looking! I am off to enjoy a day of crafting now with my friend Tristan! I hope she doesn't see this before I get to her house! Hello and happy Friday! There's a new challenge over at the CAS-ual Fridays challenge blog today and we want you to use Shades of Gold on your card. Gold screams Christmas to me but you can make any kind of card you like. I have used the gorgeous Mistletoe & Holly Stamp set on my card. 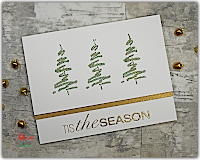 I gold heat embossed the mistletoe and sentiment and then painted the image with Prima Metallic accents watercolors. I ran a glue pen around the edge of my card panel and sprinkled it with gold glitter. There are so many different shades of gold on my card! Click HERE to check out the challenge for yourself, the rest of the Design Team have some gorgeous gold cards over there! If you would like the chance to win a US$25 certificate to spend in the CAS-ual Fridays shop, all you have to do is make a "Shades of gold" card and link it up to the challenge here. You don't have to use CAS-ual Fridays stamps but if you do use them as your main focus, Michele will double the prize to US$50. Hello, my card today isn't a card! It's a tag for the Muse challenge where Tracey is the current Muse with a gorgeous Christmas tag. Click HERE to take you over to the Muse challenge blog. Isn't it cute!! I don't have any little people stamps (that I can remember) but I do have a new stamp set from Uniquely Creative called Christmas Cookies. There are a heap of cute little images in this stamp set begging to be coloured. I chose three, coloured them in with Copics and cut them with my scan n cut. The tag is a Fri-Die from CAS-ual Fridays. I sponged CP Inks in All that Jazz and Daydream onto my tag and spritzed with water. I am also entering this in Tracey's 25 Days of Christmas Tags Day 12. Click HERE to take you over to Tracey's blog for day 12. There are so many gorgeous tags over there!! Muse Challenge #290 - Birthdays are scary! Hello, my card today is for the Muse challenge #290. This weeks Muse is Anita with this lovely card. I based my card on the colours, the balloon and the layout. I used Silly Monsters 2 from Your Next Stamp and the balloon is from Studio Katia. I coloured my images in with Zig real brush markers but they didn't blend too well on the card stock so I went over it with Prisma pencils. Hmmmm, it didn't turn out too well in the photo but it looks better in real life! How true is that sentiment when your years are marching on!! Thanks for looking and you can click HERE to take you over to the Muse card challenge to check out everyone else's take on Anita's card. Hello and happy Friday once again! We have a new challenge over at the CAS-ual Fridays challenge blog today and it is a fun sketch. I stamped one of my favourite sentiments from the Frankly stamp set and die cut some 4 petals Fri Dies. I sponged the petals with CP Ink All that Jazz and added some detail with a white gel pen. The sentiment is stamped with Black Jack CP Ink. If you would like the chance to win a US$25 certificate to spend in the CAS-ual Fridays shop, all you have to do is make a card using the sketch as inspiration and link it up to the challenge here. You don't have to use CAS-ual Fridays stamps but if you do use them as your main focus, Michele will double the prize to US$50. Hello and happy Monday! My card today is for the challenge over at CAS(E) this sketch. 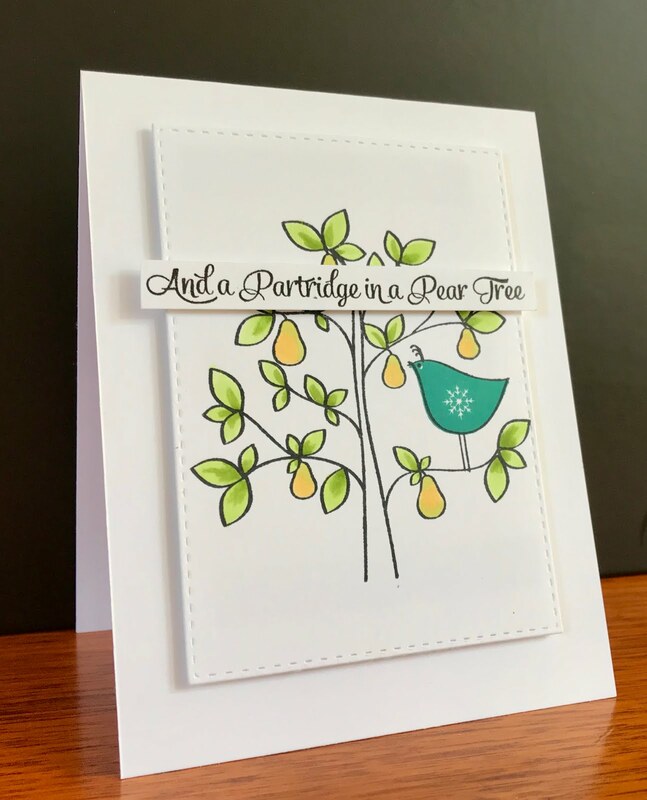 I thought the Partridge in a Pear Tree stamp set from CAS-ual Fridays fitted in well with this sketch. I coloured the leaves and pears in with Altenew Artist Markers. The Partridge is stamped with CP ink Aquatini. Click HERE to take you over to the CAS(E) this sketch challenge. I'll be back on Friday with another CAS-ual Fridays challenge. Hi, I'm back again with a card I made for the current Muse Challenge. 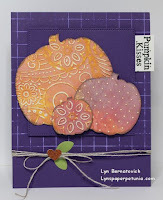 Lyn is this weeks Muse with a colourful pumpkin card. We don't celebrate Thanksgiving here in Australia so I don't have any pumpkin stamps. I have taken the colours from Lyn's card and stamped the Faithful Flutterings stamp set from CP Designs with CP Inks. I used a white gel pen and put a few dots on the wings and did a light stencilling behind the butterflies. You can click HERE to take you over to the Muse Challenge. Thanks for looking and I'll be back tomorrow with another challenge card! Hello again! 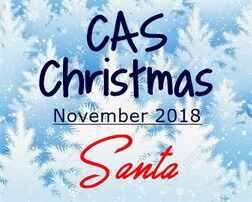 There's a new challenge over at the CAS Christmas card challenge and this month it is Santa! Believe it or not I don't have many stamp sets with Santa in it but I did find an old set I received with a paper craft magazine a few years ago. Thank goodness for the MISTI! I stamped my Santa with Memento Tuxedo black and coloured him in with Copics. I stamped a frame from Stampin Up Swirly Frames and die cut my panel with a stitched rectangle die then adhered it with foam tape to my card base. Click HERE to take you directly to the challenge. Hello and welcome to my blog! I was very excited when Michelle Lupton invited me to be a part of her Challenge me a Christmas card series this year. 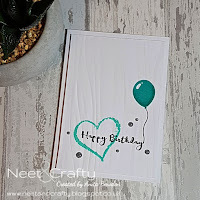 Michelle makes the most beautiful cards and is one of my very talented teamies over at the CAS-ual Fridays challenge blog. Michelle asked me to choose a theme for our challenge so I chose Reindeer! I pulled out an old stamp set from Hero Arts called Christmas Reindeer. This is such a fun set with a couple of different Reindeer's and trees in it. I stamped the leaping reindeer, coloured it in with my alcohol markers and cut it out using my scan n cut. I stamped my background with Memento London Fog ink (second generation). I also added some clear sparkly snowflakes to the background even though you cant really see them in the photo! I curved the sentiment on my block, stamped that with Versafine Black Onyx ink then heat embossed with some diamond sparkle embossing powder. I then adhered my leaping reindeer with some foam squares. I cant wait to see Michelle's card, you can click HERE to take you directly to her Reindeer card! 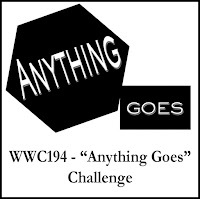 I am also entering into the Watercooler Wednesday Challenge #194 Anything Goes and Simon Says Stamp Wednesday Challenge Anything Goes! Thanks for looking and make sure you pop over to Michelle's blog, Handmade by Michelle to check out all the Christmas card challenges! Hello again! I managed to make another card for the Muse Challenge 288. Laurel Beard is this weeks Muse with this beautiful watercolour floral card. 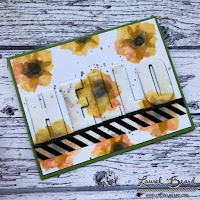 I used the same method as Laurel and inked up my CP Designs floral stamps with CP Ink and sprayed with a light mist of water before stamping onto water colour card stock. I stamped the layering stamp over the top once it had dried for some more detail in the same colour ink. I die cut the "Happy" from my stamped panel and stacked it with two other die cuts and inlaid it back onto my panel. I stamped the "birthday" onto a strip of Bristol card stock to match my card panel and adhered it with some foam tape. Here's my card, and you can click HERE to take you over to the Muse Challenge blog. Hello, today I am playing along in two challenges! They are both Christmas themed so I made a card that fits both. Muse Christmas Visions 111. This weeks Muse is Lindsey with this beautiful card. I stamped a tree from Stamp It three times with Kaleidacolor Ink and added some glitter using a glue pen. It's pretty much a direct CASE of Lindsey's card! 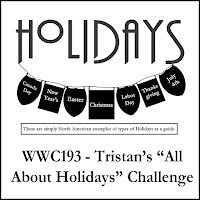 The second challenge is Watercooler Wednesday where Tristan is hosting "All about Holidays" WWC 193. Thanks for looking and hopefully I will get some time today to make a some more cards and enter a few more challenges. Hello and happy Friday! We have another new challenge up on the CAS-ual Fridays Challenge Blog today. Aren't the weeks flying by!! It will be Christmas before we know it. I am just back from a trip up north to the Sunshine Coast, Queensland. We got to see some whales in the distance from our balcony frolicking in the ocean! It was so relaxing up there even though the weather was a bit unseasonal! We had lots of rain, some sunshine and some storms but the whales made up for it! This week we have a photo to inspire you. I took my inspiration from the wood grain and pulled out an old embossing folder. I stamped the leaves from Pretty Posies stamp set and heat embossed them using rose gold embossing powder. I used my scan n cut to cut them all out. I do have the coordinating dies for this set but because I stamped so many of them, I find the scan n cut nice and quick for multiples. I stamped the sentiment from the Foxy stamp set and heat embossed it with the same rose gold embossing powder. Thanks for looking and I would love to see your card in the gallery over at the Challenge Blog. All you have to do is make a card using the photo as inspiration and link it up here for the chance to win a US$25 gift voucher to the CAS-ual Fridays shop. If you use CAS-ual Fridays stamps as the main focus of your card, Michele will double the prize to US$50. Good luck! Hello and happy Friday! We have a fun colour challenge over at the CAS-ual Fridays Inspiration Blog today. We challenge you to make a card using Pinks and Greys! Two of my favourite colour combinations! I have used the "Bushy Tailed" stamp set for my card today. I coloured him in with alcohol markers, cut him out using my scan n cut and popped him up onto a stencilled background. The sentiment is from the same Bushy Tailed stamp set. If you would like the chance to win a $25 voucher to the CAS-ual Fridays shop, all you have to do is make a card using pink and greys and link it up on the challenge blog here. Michele will double the prize to $50 if you use CAS-ual Fridays stamps as the main focus of your card! Good luck! Hello and happy Monday! My card today is for the current Muse challenge and I'm doing an Aileen and entering at the last minute! LOL I had a busy weekend with lots of visitors so my card making took a back seat. The Muse this week is Anita with this beautiful card. I was inspired by the leaves and the white frame. After I stencilled with Distress inks, I sprayed my card panel with perfect pearls which doesn't really show up in the photo but it is very shimmery in real life! Hello and happy Friday. My card today is for the Muse Christmas Visions 110 challenge. Cornelia is the Muse with this beautiful card. 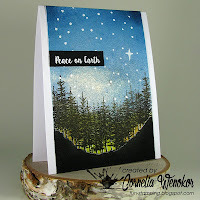 I was inspired by the trees and the beautiful sky on Cornelia's card. I pulled out another old stamp set of mine from Hero Arts called Winter Trees and inked it up with my Kaleidacolor Blue Breeze ink pad. I used a quickie glue pen on the branches and sprinkled with diamond glitter. The sentiment is from a set I got with a magazine. Do you like my new Shell Logo? My very talented friend Tristan from Tinstar Designs made it for me. Hello and happy Friday! We have a fun sketch challenge for you today over at the CAS-ual Fridays Challenge blog. I have used a combination of flowers from the Peace and Comfort and Peaceful Garden stamp sets. I stamped with Catherine Pooler Inks and cut all my images out with my Scan Cut. The sentiment is from the Frankly stamp set. There are some fun sentiments in that set and isn't that font beautiful!! If you would like the chance to win a $25 voucher to the CAS-ual Fridays shop, all you have to do is make a card using the sketch as inspiration and link it up on the challenge blog here. Michele will double the prize to $50 if you use CAS-ual Fridays stamps as the main focus of your card! Good luck! Thanks for looking and I would love to see you over at the CAS-ual Fridays Challenge blog. If you haven't already visited the Muse challenge, do yourself a favour and click HERE to check it out. I decided to make a floral card for this weeks challenge because I love all things pretty! I stamped this beautiful floral image from Catherine Pooler Designs Grateful Heart stamp set in the bottom left hand corner of my card panel. I always seem to gravitate to that spot, possibly because I am left handed. I coloured the flowers in with Kaszazz Alcohol Markers and just added a touch of grey to the leaves. I added a small strip of patterned paper along the bottom and stamped the sentiment from a Close to my Heart stamp set. 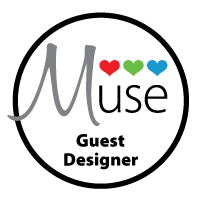 Thanks for looking and I would love you to join in on the fun over at Muse this week!